Improving your productivity, keeping you healthy and saving you money, a Mayfair Cleaning contract can benefit your business in a number of ways. Pick and choose from a wide range of services, solutions tailored to your needs, rotas that work around you - we’ll help create and maintain a safe working environment, a place that welcomes visitors and staff alike. Looking for daily office cleaning? 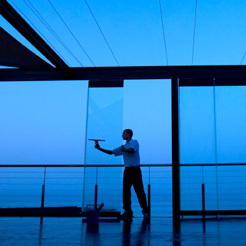 Only interested in window cleaning? Need a task force to take on a one-off job? Whatever your needs, Mayfair Cleaning will work it out. You'll soon notice a difference. You’ll see we’re easy to live with and impossible to be without. We manage our contracts with an eye on the long game, dedicated to sustaining standards others tend to let slip. At Mayfair Cleaning, we plan, we train, we care. Our dedicated people work that little bit harder to make things perfect. Our managers listen and keep you posted. 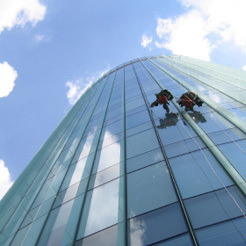 We cover all sorts of sectors, even if we don’t stray far outside the M25. But that doesn’t mean we don’t think about the rest of the planet: we're committed to the highest environmental standards, keeping things green and clean. Established over 100 years ago, The Mayfair Cleaning Company still believes in traditional values of hard work, quality workmanship and loyal, dependable service. To these we add the best of today's technologies, from hi-tech management tools to state-of-the-art machinery, offering solutions that are as sustainable as they are innovative. What makes Mayfair Cleaning different? Small. We're fiercely independent, but very flexible. Experienced. We've been around since 1910. Bespoke. We pull together all the services you require. Committed. Mayfair management and staff share a strong work ethic. Innovative. We blend traditional methods with new technology. Local. We work in and out of London, but mostly within the M25. Sharp, fresh and well turned out. Your premises can say more about you than you might imagine.